This week I finally got around to taking more pictures of Kaleb "doing school" and making a real effort to pull special things out to do with only him. Carissa at 1+1+1=1 hosts "Tot School" each week and this is my first (of hopefully many!!) week of posting along with her. 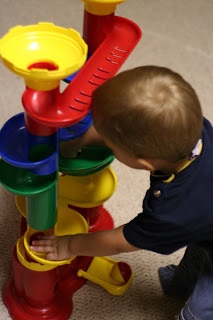 Kaleb spent some time with Daddy working with one of his Discovery Toys Shape sorters. 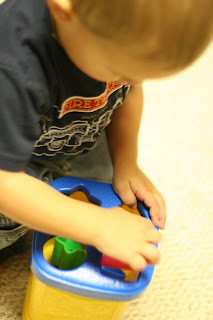 He loves popping the shape in and then quickly reaching in to grab the shape back out. 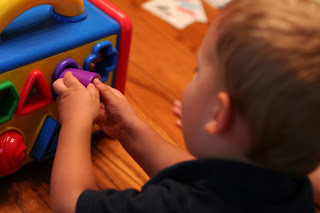 There are a few shapes he can do on his own, but I love this sorter, since it also teaches the kids to match colors as well as the shapes. While I was in the kitchen, Kaleb pulled out all of my baking sheets and we had a little music festival of sorts. 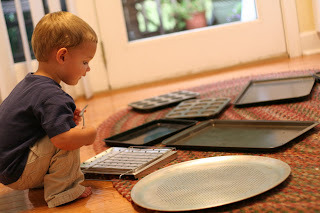 He spent a great deal of time arranging the pans "just so" and was even sweet enough to put them all right back where they belong. 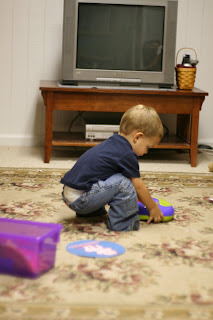 He loves to clean up (yeah for me!). We all had a great time playing Hulabaloo together. Kaleb hasn't grasped the concept of what he is supposed to do, but he has a great time trying to imitate the other kids. He was so upset when we put the game away and promptly pulled it all back out to play again by himself. He's only played with the our marble sorter a few times (since he doesn't get to go downstairs much yet) and LOVED it (of course getting the other kids to let him play by himself for a few minutes was rather difficult). He is trying to count along with me right now. When I start him on "one", he quickly chimes in ever-so-sweetly, "two." He loves to say "Go!" and each day we hear new little words coming from him. So much fun! This next week we're working with a little bit of a different schedule for our day, and that schedule will hopefully offer a fun routine for the kids that will also allow me a little more individual time with Kaleb.